There is a pets beauty pageant competition coming soon and baby Olivia cannot miss this great chance. She has already enrolled her precious puppy pets in it. Help the cute princess prepare Pumpkin, Teacup and Beauty for the fabulous beauty pageant show. Select a pet at a time and pamper it with a dazzling beauty pageant makeover. Bathing is first, so wash Pumpkin, Teacup and Beauty with soap bubbles. Rinse well, then continue with a grooming session drying the fluffy hair with a blow dryer and brushing the fur for a smooth and silky effect. Baby Olivia has the perfect dress up ideas to win the beauty pageant crown. She will be dressed up as a fairytale princess like Cinderella, Aurora or Belle. Her pretty puppies will wear sparkly princess accessories to match her outfits. What princess tiara, jewels and bow tie should Pumpkin wear to match baby Olivia's Cinderella costume? Accessorize Teacup and Beauty with the right fashion items as well. How about a fun playtime at the end of this fantastic makeover? Have an awesome time playing our newest baby game! There’s several special day at every girls life: her first date, first puppy, her sweet 16… and of course her wedding day! That feeling, when you’re entering the chapel and everyone’s looking at you. Your dress is shining and the love of your life is standing there, waiting for you to becomes his princess forever… But you know what people say: waiting for holiday is better than the holiday itself! And there’s a lot of fun things to do before the wedding day’s finally come. Like Bridal Shower! 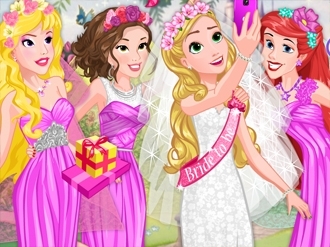 Rapunzel\\\\\\\'s best friends - Belle, Aurora and Ariel - decided to throw a party for their beloved bride. There will be a lot of presents, fun and a total makeovers! Disney beauties are can’t wait to post the joint photo on Instagram and collect tons of likes. But for this to happend, they need to choose the perfect outfits. Pretty bride and her BFF are want to look fabulous! Maybe you can help them? Look over the princesses wardrobe and choose the ideal dress and accessories for the selfie of the year. Have fun! I invite you to play the newest game about Bridesmaid game where we can use knowledge of current fashion. 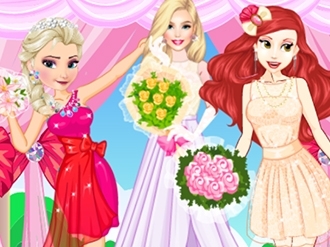 The wedding of the beautiful Barbara, is the main event of the Disney kingdom and bridesmaids are Elsa and Ariel. Use new trends in fashion and your imagination to choose the best dresses, shoes and accessories for the two beautiful ladies. Have fun with Barbara, Elsa and Ariel! 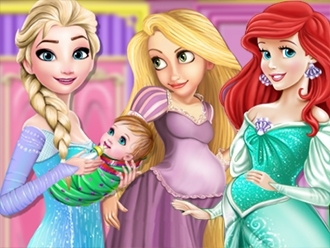 Princess Elsa wants to decorate her cute's baby bedroom and she will decorate the baby room with the help of the other princesses Rapunzel and Ariel.They are pregnant and wants to learn from princess Elsa how she could decorate her own baby room after their birth.Have fun helping the princesses decorate the baby room. Fashion Show hosts today, the beautiful princesses Rapunzel and Cinderella. The two competitors are ready for the grand final this week. Suggest them the best outfit! Have fun!